Everytime I see beautiful savoy cabbages at the market, I couldn't help buying a head. What cracked me up this particular time was how much the heads looked like a human brain, complete with the folds and the veining. Too bad we didn't get a shot of the actual savoy cabbage head to show how brain-like it really is. Shallow as I am, I couldn't help laughing at the market while looking at the cabbage. I kept repeating this phrase to myself, "This is your brain on cabbages," remembering the TV anti-drug ad, telling us that doing drugs is similar to frying your brain. Like eggs. Or is the moral of that ad that people on drugs have eggs for brains? I suppose it can work both ways. I even doubled up in laughter right there on the floor that people were starting to look at me. A while back, in her "Stuffed!" episode of French Food at Home, we saw Laura Calder layering savoy cabbage leaves with a pork filling, forming that into a ball, and steaming it. I was quite taken with it and thought it was a very Chinese application. 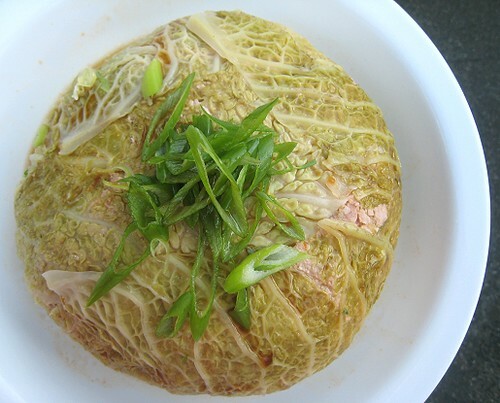 So, after seeing that JS couldn't resist buying savoy cabbages because she thought they looked like brains and seeing that CSC had once again filled the fridge with her potsticker filling, I decided to make our own stuffed savoy. We started by blanching the savoy leaves. 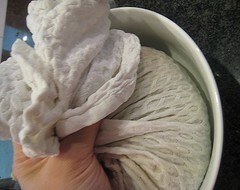 Then, on a clean cloth or towel, I layered the biggest leaves first. 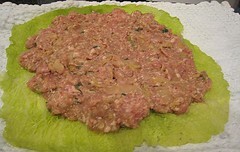 The pork filling went on next, followed by more savoy leaves, and so on. To be able to form a sphere, each ascending layer has to be smaller in area than the previous. To form the sphere, I gathered all sides of the cloth and twisted. Then, I turned it upside-down. OK, maybe it's just us, but I found this cloth-wrapped sphere really adorable and couldn't help giggling all this while... and dare I say, also playfully slapping it from time to time. Teehee. Look, it's so cute, all spherical like that! We had this set-up ready for steaming, so above the boiling water our little savoy piggy brain went. We didn't really know how long to steam it for. I think that our pork filling may have been about two pounds. We played it safe and steamed it for a long while, thinking that the pork will have a harder time overcooking in such a moist environment. After 45 minutes, we decided that there was no way it wasn't done. And so we unveiled it. How would that ad go now? "This is your brain on potstickers." 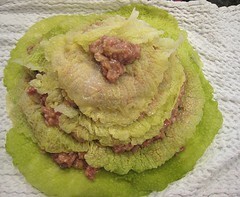 For our Pork Cabbage Brain, I made my standard potsticker dipping sauce of soy sauce, rice vinegar, garlic and water. (The water is important.) I poured some over the brain and also served more during the meal. Our savoy was very pale (Laura Calder's was dark green) and the pork may be a tad pink even when it's fully-cooked, but this was incredible. The combination of cabbage and potsticker filling (and dipping sauce) was phenomenal. 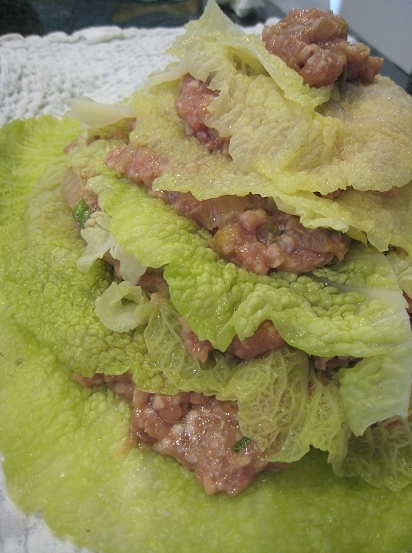 Next time, we would use more cabbage in between the pork layers. We didn't really think of this as a pork dish, but rather a vegetable dish. Everybody commented (complained?) that there wasn't enough savoy. That's a first, people complaining that there aren't enough vegetables. If you'd like to participate, see who's hosting next week. 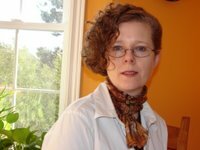 WHB is hosted this week by Kalyn herself! I have a tried and true recipe that I use for our dumplings/potstickers. I definitely have to make this. I was so excited when I saw this post! 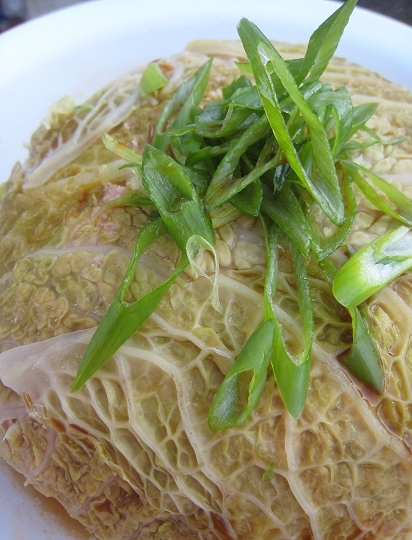 I absolutely adore stuffed cabbage. This was a splendid post, and your photos showing step by step are appreciated. Well done, and oh how I wish I was dining with you. Wow - i bet this was absolutely delicious! I bet this was....wow. The layering is so interesting...a blooming flower. Must be so so juicy! i'll be keeping an eye for this cabbage...it's like a dream come true...all leaves and almost no stem! woohoo! You're having fun the whole way and then you have something great to eat at the end. Way to go! Anyone wanting to know more about savoy cabbage can check out cabbage types if they wish. This is great - you've managed to take something that I would never, ever cook in a million years and make it look appetizing. For all the silliness this really is a brilliant dish. 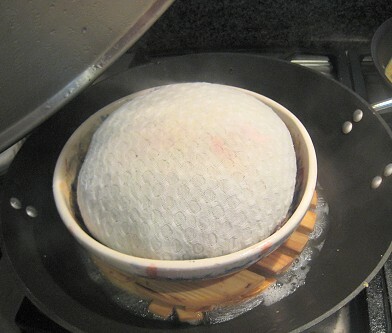 I imagine it tasted wonderful, and the shape and steamed cooking method really impressive! Wow, I've never had something like this. It looks yummy. I wish I could just hop on over to Vancouver and have a bite. That looks really delicious. 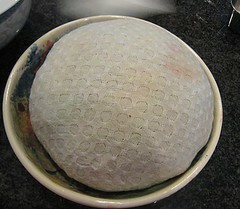 Looks like a huge gyoza bombe (without the wrapper); so innovative! That's a very creative dish! It looks awesome and you sure wouldn't hear me complaining. I too was struck when Laura Calder made this and your post here is ambitious and successful. I've got to try this, thnx! Very interesting and quite delicious sounding. I'm not sure I've ever cooked savoy cabbage, and this has made me want to try it. This looks so cool!! 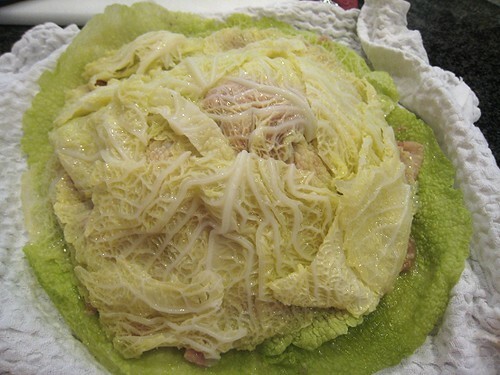 The sliced piece is like meat and cabbage cake. I missed that episode. You did really good. What a very unique and interesting recipe. I have to tag this one - what a great show stopping dish to make. Wow that's gorgeous! I loves stuffed cabbage in general but stuffed with pork is even better. wow!! interesting and creative!! 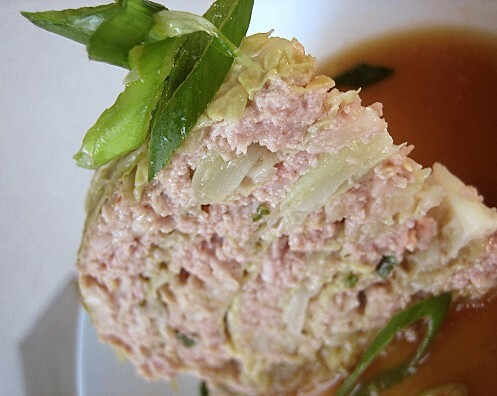 both of you really have great idea to use something simple,pork and cabbage to make a great dish! Oooh, those layers look awesome. The sphere does look like a brain! Hehe. You are silly! What a fun post. It DOES look like a brain. Looks yummy too. Dumpling fillings are so versatile. Thanks! We were so excited to try making this too. We really wished we had more savoy and less meat... it would have even juicier! The stems are fairly OK to eat. We don't really botther removing stems from cabbages. Lazy. Hehe. Haha. Was it the pork filling or the savoy that you wouldn't eat? Teehee. That spherical shape and the brainy appearance, for some reason, just tickles us. Oops, we finished it all already! Ooh, you jkust gave it a new name! It *is* a bombe!! We didn't realize that savoy cabbages may not be as common as we thought! Thanks! We'd love to see your version. We were really so excited to make this! Glad you guys arew enjoying it. check this one out! aweseome... how the HELL did you eat this thing!? Wow! That is the best looking cabbage roll. Your blog is the first in my reader and for good reason :) I am insanely hungry for your food. Look at that stuffed cabbage. Got to try it sometime. Haha... If civilized, then cut into wedges. If not, hiding it from others. It's like a brain-shaped pork and cabbage layer cake! Now there's a snappy title for you... :o) I love the idea and the fun assembly - great post!